Hypholoma capnoides (sometimes called Naematoloma capnoides) fruits in clusters on conifer stumps and logs. 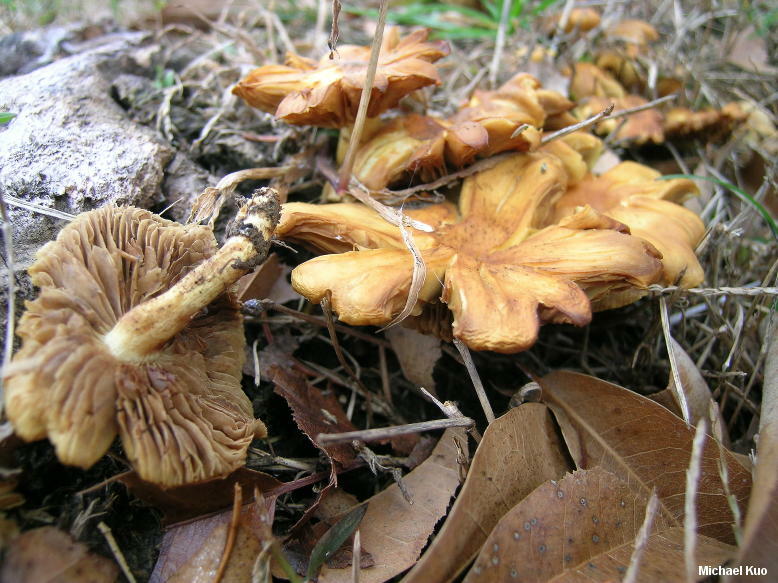 It is typically a fall or winter mushroom, but can be encountered in the spring as well. 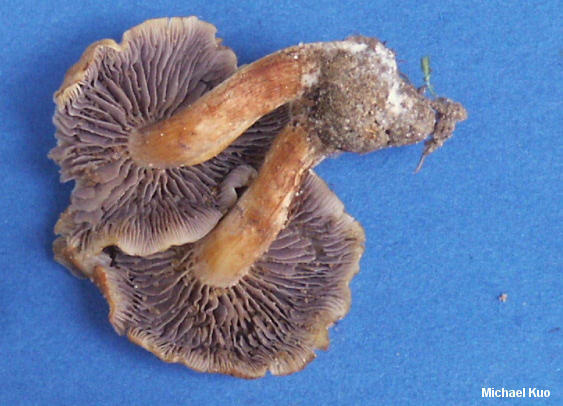 Distinguishing features include the yellow-brown to cinnamon cap, the purplish brown spore print, and the lack of a ring on the stem. 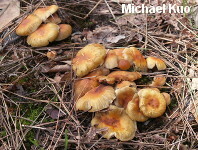 Two other common Hypholoma species are similar; Hypholoma fasciculare has yellowish green gills when young, and a bitter taste--and Hypholoma sublateritium has a brick-red cap. 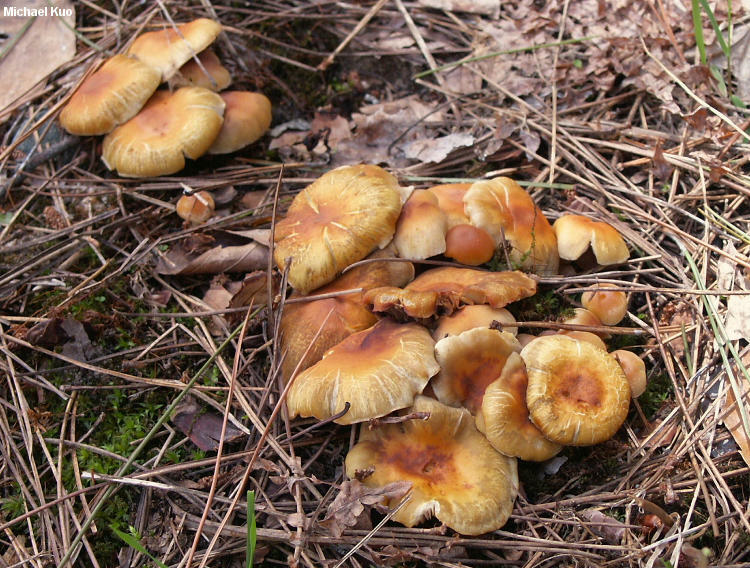 Ecology: Saprobic; growing in clusters or gregariously on or near decaying conifer logs, especially on the wood of pines and Douglas-fir; often common in pine plantations after trimming operations; fall and winter, sometimes in spring; widely distributed in North America. The illustrated and described collections are from Michigan, Illinois, and Québec. Cap: 2-6 cm; bell-shaped to convex, becoming broadly bell-shaped, broadly convex, or nearly flat; sometimes with an incurved margin when young; often with wispy partial veil remnants on the margin; bald; dry; yellowish brown to orangish brown or cinnamon brown, but somewhat variable in color; usually darker over the center and paler toward the margin; often splitting radially when mature. 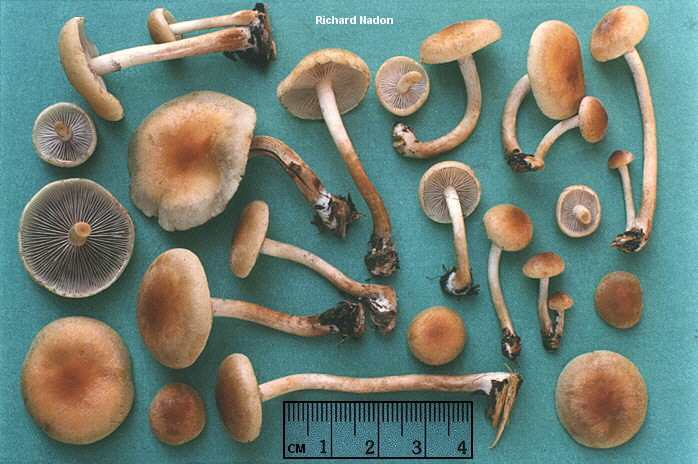 Gills: Attached to the stem or beginning to pull away from it; close; whitish to yellowish at first, becoming gray and eventually smoky brown; short-gills frequent. 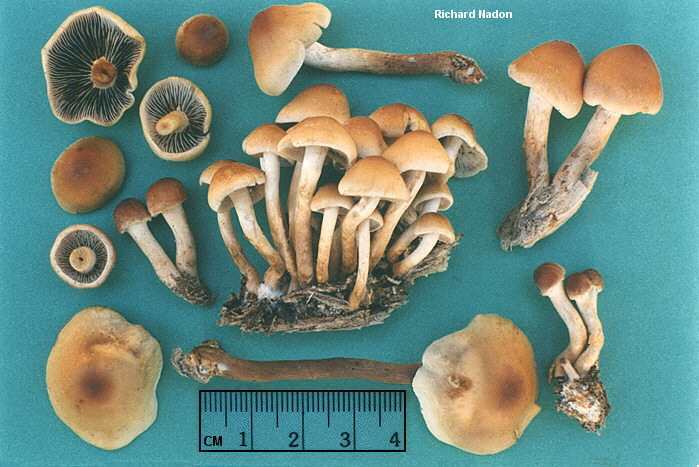 Stem: 2-8 cm long; 4-10 mm thick; tough; more or less equal, or tapering somewhat to base when growing in tight clusters; bald or finely silky; colored like the cap, or more pale. Flesh: Whitish to yellowish; sometimes slowly yellowing when sliced. Chemical Reactions: KOH red on cap surface. 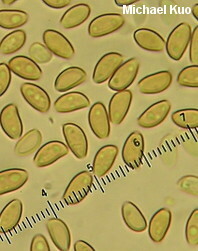 Microscopic Features: Spores 6-9 x 3-4.5 µ; ellipsoid; smooth; with a small pore; thick-walled; yellowish in KOH. 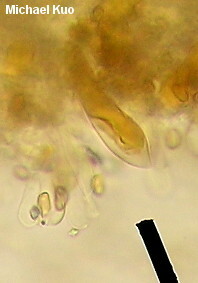 Cheilocystidia hyaline; subclavate; thin-walled. Pleuro-chrysocystidia mostly fusoid-ventricose to submucronate; thin-walled; 35-50 x 10-13 µ. Pileipellis a cutis or an ixocutis. REFERENCES: (Fries, 1818) Kummer, 1871. (Fries, 1821; Saccardo, 1887; Smith, 1949; Smith, 1951; Smith, 1975; Stamets, 1978; Smith, Smith & Weber, 1979; Weber & Smith, 1985; Arora, 1986; Phillips, 1991/2005; Lincoff, 1992; Barron, 1999; McNeil, 2006; Miller & Miller, 2006; Trudell & Ammirati, 2009.) Herb. Kuo 05289501, 05170202, 11290902.